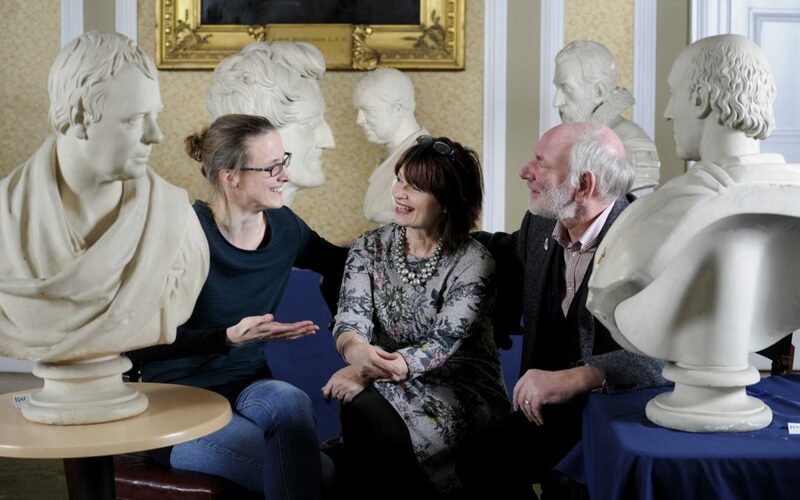 The national launch of A Year Of Conversation will take place with a day-long event hosted by the Royal Society of Edinburgh, Scotland’s National Academy,to celebrate and explore the way we speak to one another. The Scottish and international initiative, led by its creative director the poet Tom Pow, brings together high-profile partners in a bid to celebrate the positive power of conversation to open our minds and to counter growing social polarisation. The Art of Conversation, which is free but ticketed, will look at everything from conversation in a digital world, the history of conversation and how to speak with Generation Z to conversation through the arts. It takes place at the Royal Society of Edinburgh (RSE), George Street, Edinburgh on 16 February. Pow said:“A Year Of Conversation is about celebrating, initiating and exploring conversation in our lives. At a time when mutual understanding appears threatened, when communities are becoming closed off, this project will show that our culture is an open one – or show the role of conversation in helping it to become one. “The vision is for something national and international, serious but playful, both necessary and important. It will demonstrate the truth of Montaigne’s words, ‘We belong to all countries’. “True conversation makes life richer and gives us the chance to build up empathy and build connections and gain fresh perspectives across borders, cultures and generations. The RSE is the perfect partner for the national launch as it is renowned worldwide for its work to share knowledge and understanding about everything from science and technology to the arts, humanities, business and public service. Founded in 1783 its fellows have included some of Scotland’s greatest scientists, engineers and thinkers. Professor Dame Anne Glover, President of the RSE, added:“Conversation opens our minds to a whole universe of knowledge and ideas. It’s fundamental to who we are as human beings and how we understand our world – so we are delighted to be hosting the national launch event for A Year Of Conversation. The Art of Conversationfeatures speakers from a variety of disciplines who enjoy sharing their knowledge and ideas about how we talk to, and with, each other. Some, like Dr Marieke Schouwstra of the School of Philosophy, Psychology and Language Sciences, University of Edinburgh, explore the outer limits of human conversation. Dr Schouwstra, who will be discussing non-verbal conversation and communication, said: “People often think of conversation as being all about speech – but there can be much more to it than that. “Humans are incredibly willing and interested in sharing thoughts and information. And as an evolutionary linguist, the experiments I carry out show that even when we don’t share a language we strive to converse, often using things like gesture. A Year of Conversation will involve events and activities all across Scotland. These will aim to get people conversing in a multitude of ways and about a wide variety of topics. Some will be about conversation in our personal relationships, others will involved wider social, health and political issues. Some involve scientists and academics, others focus on artists, musicians, writers and storytellers. A Year of Conversation is working with a wide range of organisations in the wider cultural world including the National Library of Scotland, Scottish Book Trust, The Stove, Voluntary Arts Scotland, Highlight Arts, The Lyceum Theatre, the Scottish Storytelling Centre, The Scottish Poetry Library, The Playwrights’ Studio, Literary Alliance Scotland, Edinburgh International Books Festival, Wigtown Festival Company, StAnza, DG Unlimited and the University of Glasgow. Events will take place all across the country and will explore and celebrate the power of conversation in the past, present and future and in every form, whether it’s face to face or digital. Conversation in a digital age. A set of free-to-use pictures is available with this press release and is being sent to picture desks. If you would like to receive them please get in touch. For further media information contact Matthew Shelley on 07786704299 or Matthew@ScottishFestivalsPR.Org. The event will consist of various sessions examining the different ways we converse, and promises to be a most informative and enlightening day. 1000–1130Conversation in a Digital World.Conversations in relation to the digital age and the effects on society. Dr Iain Donald, Lecturer in Interactive Media Production & Academic Enterprise Leader, Abertay University. Mr Ian Le Bruce, Director, Ignite. Associate Professor James Blake, Director of the Centre for Media and Culture, Edinburgh Napier University. 1230–1400The Art of Good Conversation.The development of conversation through the years. Professor Jeremy Smith FRSE, Professor of English Philology, University of Glasgow. 1500–1630Creative Conversation.The portrayal of conversation through art, drama and literature. Chair: Professor Maggie Kinloch FRSE, Freelance Theatre Director. Professor Deirdre Heddon, School of Culture and Creative Art, University of Glasgow Dr Graeme Wilson, Research Fellow, University of Edinburgh. 1145–1230Children and Conversation.How technology shapes children’s interaction and communication: looking forward. Dr Andrew Manches, Chancellor’s Fellow, University of Edinburgh. 1415–1500Speaking Without Words.Discussing non-verbal conversation and communication. Dr Marieke Schouwstra, School of Philosophy, Psychology and Language Sciences, University of Edinburgh. 1645–1730Should I Talk About It?Talking about mental health and approaches to starting conversations. Mrs Julie Cameron, Head of Programmes (Scotland), Mental Health Foundation. The Royal Society of Edinburgh, Scotland’s National Academy; is a leading educational charity which operates on an independent and non-party-political basis to provide public benefit throughout Scotland. Established in 1783, it draws upon the considerable strengths and varied expertise of its Fellows from a wide range of disciplines who are based in Scotland, the rest of the UK and beyond. The RSE awards research funding, leads on major inquiries, informs public policy and delivers events across Scotland to inspire knowledge and learning.